There’s nothing like the cold weather to remind you of how much work your house needs. The holidays weren’t a big help, either. As family arrives and we clean like we’ve never cleaned before, we start to notice places that need touch-up paint or a chipped tile or dingy window dressings and we swear that, as soon as the holidays are over, we’ll get to all these updates and more. Of course, if you’re like us and winter finds you indoors more often than you’d like, you decide to take on an entire kitchen remodel. Nothing is ever simple in our family. Go big or go home. However you’d like to phrase it, if it needs to be done, we like to do it right and we like to do it in a big way. You might recall the before pictures of our project kitchen; so bland and white. It was a nice kitchen, indeed, but didn’t have our personality. With a little help from our friends at Glass Tile Store and Giani Granite, we are so excited with our progress and the transformation is looking amazing! Our Nexus York Random Brick glass tile is utterly amazing in our kitchen! Our once drab kitchen now feels like an elegant place to gather and cook. Since our project home has an open floor plan, our new backsplash gives an updated feel to three rooms at once, so it’s definitely worth the investment. The combination of the dark olive and khaki glass, varied in frosted and polished finishes, with the white thassos and lagos azul is sleek and modern. The tile comes in squares with a mesh backing so installation is made easier and the tiles can come apart to allow a more customized layout. When the sun pours in our kitchen, the reflections on the tile give a luminescent beauty that make our kitchen look and feel gorgeous. At night, with indoor lighting, it offers a warmth that creates the perfect mood for a relaxing dinner in our eat-in kitchen. 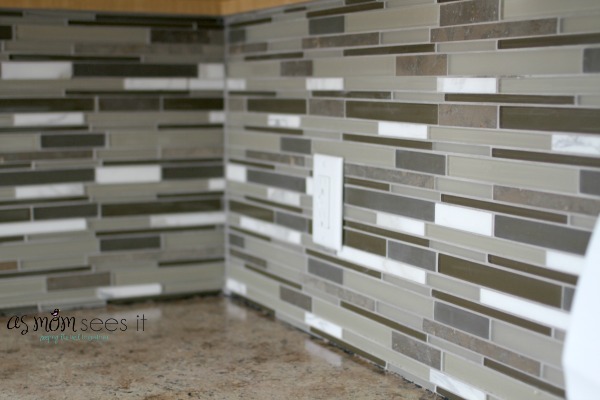 We are just tickled with our choice of tile and thrilled to have chosen Glass Tile Store. Our tiles arrived quickly and safely boxed. Shipping was free and the cost was comparable to other places we looked. 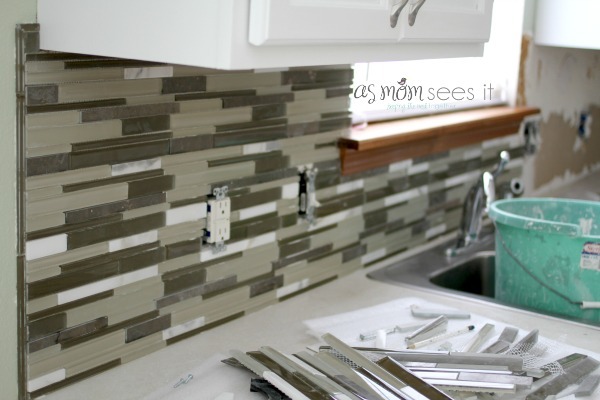 The best part – we didn’t have to drive to 5 different places to find the tile we wanted. 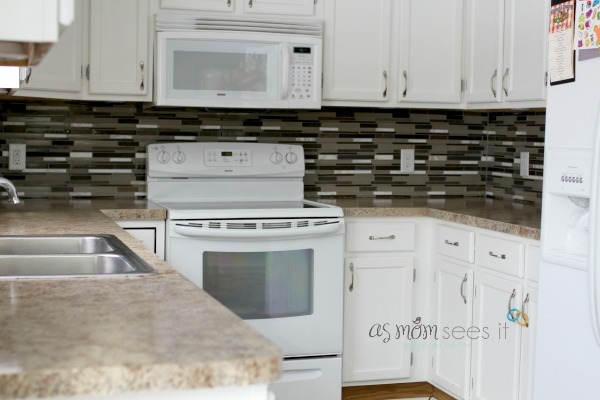 We shopped from our kitchen itself so we could be directly in front of the cupboards, flooring and appliances to which we were matching our tile. 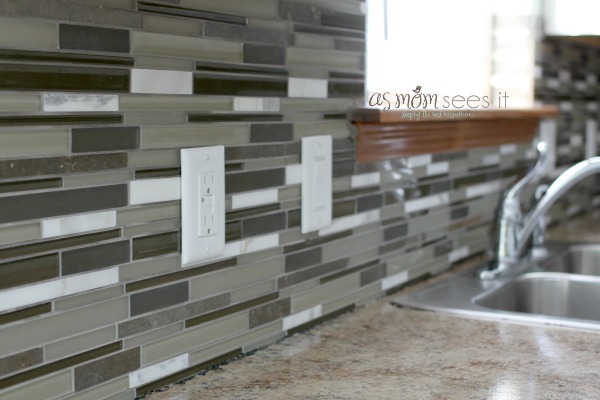 We could also easily order samples from Glass Tile Store. We had a few choices in mind and thank goodness for the samples because what we thought we’d love ended up not working. The less obvious choice worked out to be the best choice and we love it! 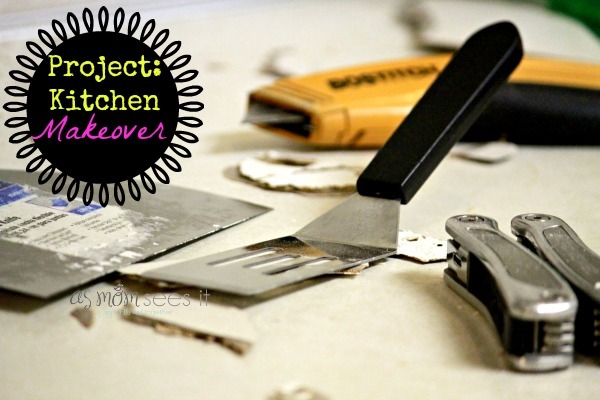 Next in our project kitchen, we makeover our countertops for less using granite countertop paint! Beautiful, I love that backdrop!! Looks like you guys did some excellent work!